James "Barney" O'Donnell has been charged nine times, reprimanded or fined, and is still licensed by the state. Earlier this year, we shared a story with you detailing charges against O'Donnell involving the discover of performance-enhancing steroids in his kennel and another in which he has been accused of placing the signature of a dead veterinarian on vaccination forms. 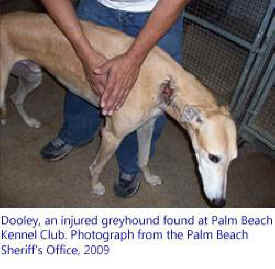 This week, WPTV of West Palm Beach reported on yet another Florida greyhound trainer accused of abusing greyhounds. Based on state records gathered by GREY2K USA, reporter Katie LaGrone reveals that Robert Dawson has been cited more than a dozen times, many times for drug violations. In 2012, a greyhound at Dawson's kennel tested positive for a metabolite of cocaine. In January of this year, another dog of his tested positive for the drug procaine. And yet Dawson is still licensed by the state! Unfortunately, Dawson is not alone. As the Miami Herald reported in September, lax regulations allow dog track violator to delay punishment for years. Another chilling case is that of Osman Martinez who was arrested in March 2009 when one of his dogs was found with an open wound. Dooley's neck was infected and investigators found blood and fluid oozing from his neck. Even though Mr. Martinez agreed to a plea deal and was supposed to surrender his license, somehow he was able to work with greyhounds for nearly four more years after his animal cruelty arrest – during which time he was fined again for a drug-positive dog. One year ago, greyhound named Rude Reuben tested positive for a metabolite of cocaine at the Mardi Gras track. Less than one month later in January 2014, another greyhound named Me Me Me tested positive at the same track. Both dogs had the same registered trainer and owner, Benjamin Espinal and John E. Weber. To learn more about the use of cocaine in the dog racing industry, read GREY2K USA Executive Director Carey Theil's blog. It is clear that the state is failing the dogs, the track is failing the dogs and the kennels are failing the dogs. We must end dog this cruelty now. As the new legislative session gears up, we will keep you informed on ways to help save the greyhounds from this abusive industry, in Florida and worldwide.